Xylitol Lime Mint is my husband’s favorite chewing gum. We discovered it when we lived in Japan, and so far, that’s been the only place we’ve found that particular flavor. We left Japan with half a dozen 100-count tubs in our household effects. We coerced friends who left Japan a year after us to send us half a dozen more before they moved. One of my husband’s coworkers recently traveled to Japan on vacation, and we begged her to put as many as she could in her suitcase on the return journey. My husband made an unexpected business trip to Japan a couple months ago, and he loaded up his suitcase as well. Another coworker is transferring to Japan this summer and we’ve informed her that during her three-year posting, she will be receiving periodic requests to send more gum. Turns out Lime Mint gum has more going for it than just a fresh, clean flavor and a tendency not to get hard even after eight hours of constant chewing. Its key ingredient, xylitol, is something of a dental health miracle. Xylitol is a natural sweetener, occurring in most fruits and vegetables, but derived for commercial purposes mainly from corncobs and beech trees. Its chemical structure is different from other sugars, which enables it to inhibit bacteria in the mouth from adhering to teeth and gums, therefore reducing the incidence of cavities (by up to 70% according to some studies). 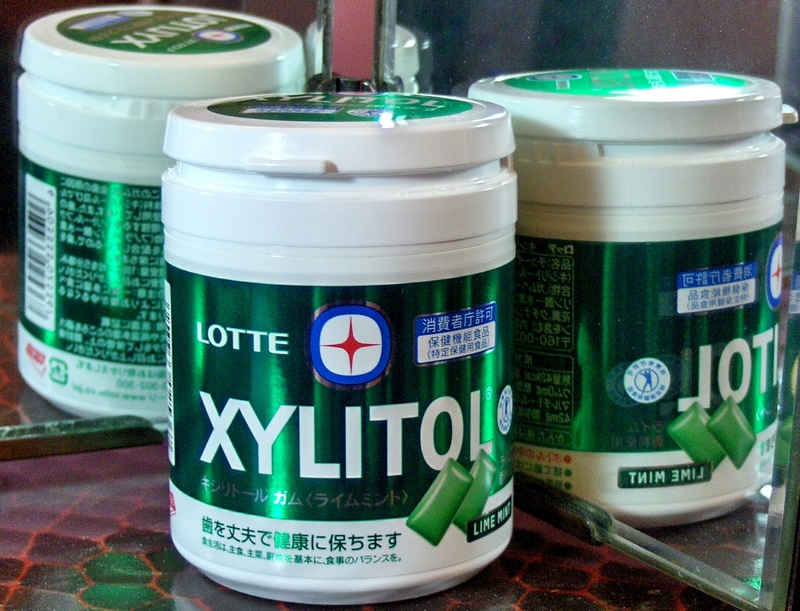 Xylitol also appears to help in the remineralization of enamel, making teeth stronger over time. Researchers urge consumers to “strive for five”–using xylitol toothpaste in the morning, using xylitol rinse or chewing xylitol gum after breakfast, lunch, and dinner, and brushing with xylitol toothpaste again before bed. The benefits don’t stop with oral health. Xylitol has a lower glycemic index than sucrose (7 as opposed to 87), so can be a good alternative sweetener for diabetics. It contains 43% fewer calories than sucrose, so also makes sense for those trying to lose weight. When used as a nasal spray, xylitol inhibits growth of bacteria in the nasal cavities and sinuses, thus reducing the incidence of upper respiratory infections. Some studies even indicate that when xylitol spray is used daily, asthma sufferers notice a significant decrease in the number of asthma attacks. So, as a former 3rd grade teacher who frequently made students spit out their gum (all the while hoping they would not notice the piece I was chewing), I wonder how long it will be before some enterprising student gets a doctor’s note saying he must be allowed to chew gum in school for health reasons? NOTE: While xylitol may be a wonder substance for humans, it is highly poisonous to dogs. Even the ingestion of a couple pieces of xylitol-sweetened chewing gum can cause a surge in insulin in canines, creating a dangerous drop in blood sugar levels in as little as 15 minutes; larger doses cause severe liver toxicity within 24 hours. Both conditions can quickly be fatal, so it is vitally important to keep all xylitol products out of the reach of Fido. When my daughters were younger, our pediatrician recommended that they chew Xylitol gum to help with ear infections. My sister uses it to make ice cream, but if you eat too much of the ice cream, it has a very undesirable gastric side effect (enough said). When I first started reading this I was thinking to myself how unhealthy xylitol sounded. I was surprised to learn of all its benefits. It’s definitely sad when you find something you enjoy in another country and cannot get it any longer when you move away. Russia has the most delicious yogurt I’ve ever tasted, and I still yearn for it on occasion to this day.